… among God’s people in God’s world; in the hearts of those who, like me, claim to follow Jesus and too often get it wrong. the holder of a valid visa refused entry because of a Presidential Executive Order which may have been unconstitutional and unlawful. someone living in N. Ireland hoping the Executive might have led the country prudently and selflessly rather than selfishly slithering into yet another potentially tribal election. a disoriented refugee family facing rejection and suspicion because they are different from “us”. In the early hours of Sunday 24 July 2016, someone started several fires inside Saintfield Road Presbyterian Church in Belfast. On Sunday 5 February 2017 – 30 Sundays later – we worshipped God again in our own buildings. Not in the church itself, but in the church hall. It was a time for rejoicing at having got this far; for thanking local churches and the local primary school for the use of their premises; for continuing a preaching series on prayer; for praying for wisdom in planning the church restoration – but most of all for thanking God and acknowledging that he is in control. So how is this story about my church’s problems connected with where I started above? We are sorry that we are so obviously sinful. We recognise that we are selfish if our well-being is threatened. We see intolerance within us when we hear and see what is unfamiliar and we lack a generosity of spirit and an attitude of hospitality and acceptance. But Father God, we see that you are good and pure and with you there is full acceptance and generosity and safety. And my friend’s prayer is so relevant to a story I plan to post in the next few days. It is based on some news from a Wycliffe Bible Translators UK & Ireland colleague living and working in a West African country where she is so obviously “different”. Jesus had a habit of answering questions with his own rather challenging questions. But then God has given us a lot of clues about how to live our lives in relationship with him – and in community. And then throughout the rest of the Bible! Which is why Wycliffe Bible Translators exists: to enable all peoples to engage with the Bible in a language which speaks to their heart. It’s how God shows us humans how to live in his creation. So when the young man got up from his bench, saying goodbye to Jesus… I wonder what he did next? Today, on Boxing Day it comes to an end… not with praise and worship and “Glory to God in the highest” – but with an asylum seeking family; with infanticide; the anguished uncomprehension of parents: the horror of King Herod’s self-centred, self-serving, senseless and futile massacre of innocent children. Have you watched to the end? God was and is still working out his purposes despite the evil of powerful men and the willingness of soldiers to obey evil orders. Mary and Joseph and the birth of Jesus in a stable is the stuff of nativity scenes: carved figures, paintings, pottery versions. But what was it really like? Take a look and empathise with the stresses on Joseph finding a place for his pregnant wife. My recent “No room at the inn” focussed on hospitality African style. Which hospitality do you prefer – Bethlehem or Nairobi? Which style do we live out where we are? Friends Paul and Emma work with International Teams and are leaders of the refugee and asylum team based at St Rollox in Glasgow. Paul sent me this photo. 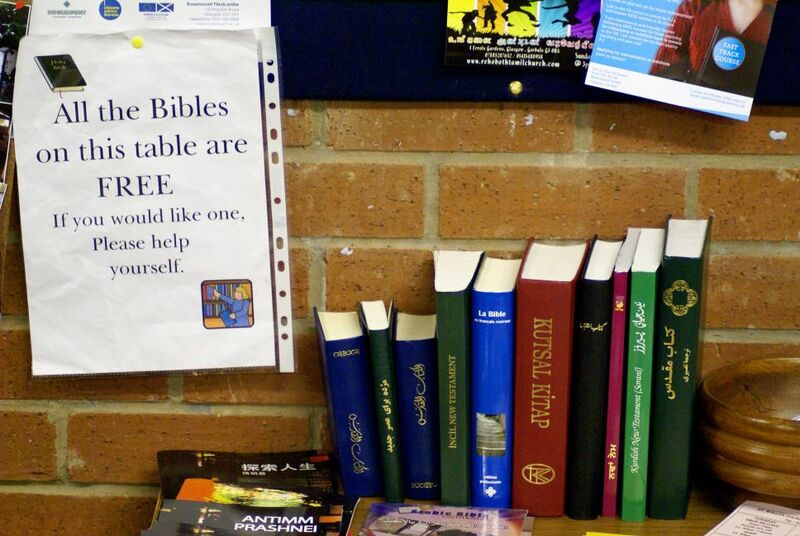 It’s great that asylum seekers can be helped with all sorts of advice, food and clothing, English classes, travel passes, destitution relief, somewhere to hang out – and also access to the Bible in their own languages! Can anyone identify the languages of these Bibles? I’ve spotted French, Kurdish, Turkish… any more?